Life for the cows on the Barmer farm is simply hideous. As if the farmer wasn’t bad enough, there’s his awful wife as well. Luckily, Professor McMoo is such a clever cow that he has built a time machine to transport himself and his two cow friends, Pat and Bo Vine, away from the farm. But just as they’re about to make their escape – disaster! A terrible THING – a ter-moo-nator, a robotic cow from the future – appears out of nowhere and attacks them! Just as the brave trio see off their attacker, yet more strange cows arrive, dressed all in black. 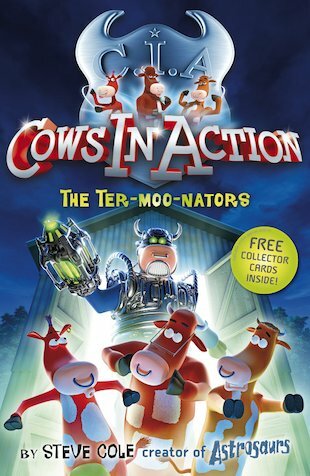 They are agents of the CIA – Cows in Action – a team of cow commandos from the future. They need Professor McMoo’s time-travelling help to put right mistakes in history! But can our brave cow heroes help without being ter-moo-nated themselves? Make a delicious cow-pat chocolate cake. What’s going on in the Cows In Action farmyard now?! Here’s a scene for you to colour in. Go undercover as one of the Cows In Action team with this a-moo-sing mask for you to colour in! Throw your own Cows in Action party. 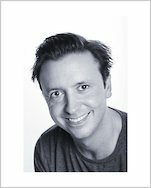 Steve Cole is the hilarious, best-selling author of Astrosaurs, Cows In Action and the brand new Slime Squad.